396 pages | 35 Color Illus. | 180 B/W Illus. Although lunar exploration began in the 1960s, the moon and other planets have many long-standing, unanswered questions about planetary environments, origin, formation and evolution, magnetization of crustal rocks, internal structure, and possible life. However, with the recent development of planetary geodesy and remote sensing with higher spatial and spectral resolution have come new opportunities to explore and understand the moon and planets in greater detail. 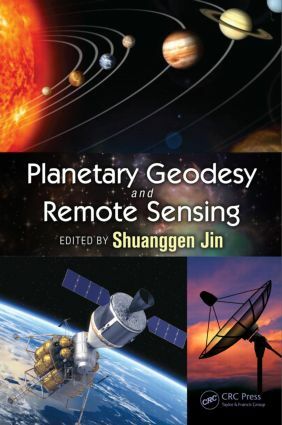 Written by well-established, international scientists in the planetary science and remote sensing fields, Planetary Geodesy and Remote Sensing presents the latest methods and techniques of planetary geodesy and remote sensing. The book discusses the latest results in planetary science, including theory, methods, measurements, topography, gravity and magnetic field, atmosphere and ionosphere, geomorphology, volcano, craters, internal structure, and water. The book also highlights comparative studies with the earth in the atmosphere, geomorphology, and interiors of the planets. It discusses future missions and future objectives of planetary exploration and science using the latest advances in remote sensing. With chapters contributed by a stellar list of pioneers and experts, the book provides new insight on the application of new technologies and the observations in planetary geodesy. It is suitable for those working in the field as well as for planetary probe designers, engineers, and planetary geologists and geophysicists. "Geodetic observations such as measurements of gravity, topography and rotation using radio wave, laser, and image techniques provide one of the fundamental ways to study planetary bodies. When integrated with other remote sensing data from spectrometers, microwave radiometers, magnetometers, etc., the geodetic data provide scientists an invaluable vantage to understand internal structure and evolution of planetary bodies. Planetary Geodesy and Remote Sensing presents a synthesis of theories, methods, and techniques as well as current understanding and future application in the relevant research fields. This book will be of interest to students and researchers in lunar and planetary geodesy and geophysics." This book documents the interesting results from the Chinese Chan'E program for the Moon. It is certainly a remarkable contribution to lunar science." Shuanggen Jin is professor at the Shanghai Astronomical Observatory, CAS. He completed B.Sc. degree in Geodesy/Geomatics from Wuhan University in 1999 and Ph.D. degree in GNSS/Geodesy from University of Chinese Academy of Sciences in 2003. His main research areas include Satellite Navigation, Remote Sensing, Satellite Gravimetry, and Space/Planetary Sensing. He has written over 200 papers in JGR, IEEE, EPSL, GJI, JG, Proceedings, etc., five books/monographs, and has five patents/software copyrights. He is the President of the International Association of Planetary Sciences (IAPS) (2013–2015), Chair of the IAG Sub-Commission 2.6 (2011–2015), Editor-in-Chief of International Journal of Geosciences, Associate Editor of Advances in Space Research (2013), and Editorial Board member of Journal of Geodynamics and other six international journals. He has received many awards during his career; they are Special Prize of Korea Astronomy and Space Science Institute (2006), 100-Talent Program of Chinese Academy of Sciences (2010), Fellow of International Association of Geodesy (IAG) (2011), Shanghai Pujiang Talent Program (2011), Fu Chengyi Youth Science and Technology Award (2012), Second Prize of Hubei Natural Science Award (2012), Second Prize of National Geomatics Science & Technology Progress Award (2013), Liu Guangding Geophysical Youth Science & Technology Award (2013), etc.